Edge 1030 includes the latest navigation tools and is compatible with our expansive line of cycling accessories that let you measure key aspects of your performance, and awareness add-ons that can help create a safer riding environment. This is what makes the Edge 1030 the top cycling computer on the market. Trendline gathers all of the different paths cyclists using the Garmin Connect app travel and displays it right on the device. This lets users find the best on-and-off routes for their ride. Riding in a group or planning to meet some friends? Just use the Rider-to-Rider messaging feature built right into the Edge 1030 device. With it, you can send pre-written notes to another 1030 device, letting another ride know you're right behind them. Cycle Maps and Alerts lets you clearly see the trail you're blazing and makes you aware of any sharp turns that might be up ahead. Customize your riding experience by designating certain routes as "favorites" on Strava - they'll automatically sync with your Edge 1030 so you can ride and compete on your favorite routes anytime. ADVANCED CYCLE METRICS & TRENDLINE POPULARITY ROUTING - Using the heart, speed & cadence sensors, the Edge 1030 provides the most advanced data metrics in the cycle market | Gathers the most popular paths cyclists using the Garmin Connect app have used and displays it right on the device. This lets users find the best on-and-off routes for their ride! A MEMORABLE GIFT - Your special someone will love every part of this gift bundle! 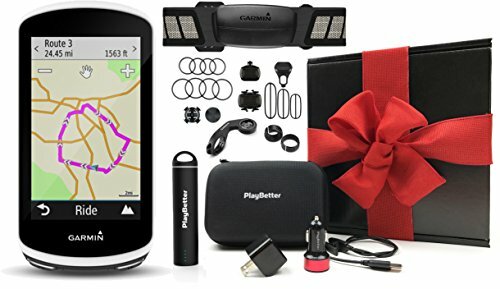 The Heart, Speed and Cadence sensors provide amazing amounts of additional data while the PlayBetter Protective Hard Case protects your investment! The PlayBetter USB Portable Charger (2200mAh) and USB Car/Wall Charging Adapters ensure you'll never be without a charge! All packed in our beautiful gift box with a red bow and decorative crinkle paper!